Apple announced new computers in October 2009: a redesigned MacBook, a beefier Mac mini (including a new Snow Leopard Server edition), and two new iMacs. All of them were impressive. The iMacs, sporting 21.5- and 27-inch wide displays, got the most attention, but I was personally most interested in a rodent, the new Apple Magic Mouse. Or they used to be. Once upon a time, wireless mice used infrared signals, and these frequently just didn’t work right; anything and everything tended to block the signal between the mouse and the receiver. Early Bluetooth mice replaced infrared light with radio signals; this worked well, and was less susceptible to signal loss. Unfortunately, computers weren’t designed with Bluetooth devices in mind, and the software to make them work was poorly written and poorly supported. But new, modern Macs (meaning those from the last four years or so) usually have Bluetooth built in, and Mac OS X 10.5 and 10.6 fully support Bluetooth. So I thought, maybe it is time to try wireless mice again -- if only someone would design one that was (a) low-profile, (b) fully supported in software, and (c) less irritating than Apple’s previous effort, the Mighty Mouse, with its frustrating and frequently unreliable Scroll Ball. What can be mightier than the Mighty Mouse? How about a Magic Mouse? Looking more like a futuristic spacecraft than a mouse, the Magic Mouse has no Scroll Ball, or scroll wheel, or in fact any moving buttons or balls or wheels or anything across the top surface. There is no cord, so it is a tail-less mouse; were it not for the Apple logo at one end, it would be difficult to figure out which end was for the palm and which for your fingertips. 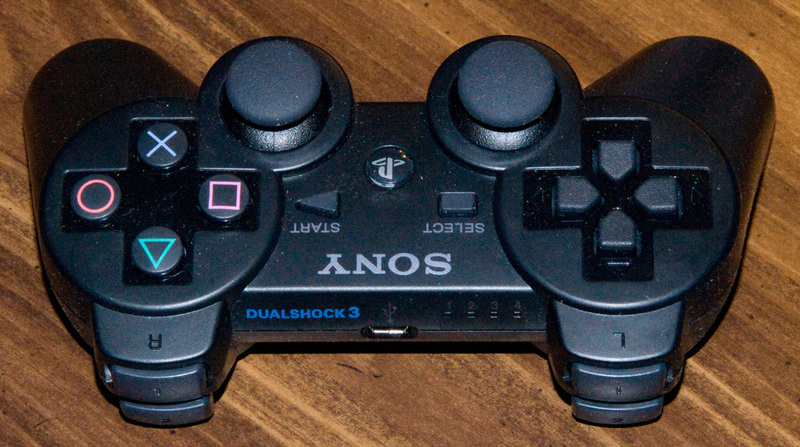 No buttons, no ball, and no wheel mean nothing to gunk up or get dusty. No cord means nothing to get tangled, nothing to jerk your hand back when you try to move the mouse too far, and nothing to plug in. 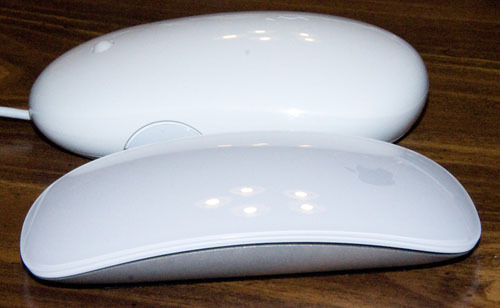 The Magic Mouse, in the foreground, has a lower profile than the Mighty Mouse (in the background) and is clearly much sleeker. This should mean less strain on your tendons, and less chance of developing carpal tunnel syndrome. 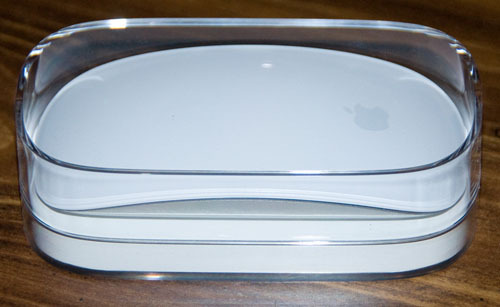 Technically, the Magic Mouse does have a button: the entire top surface of the mouse. 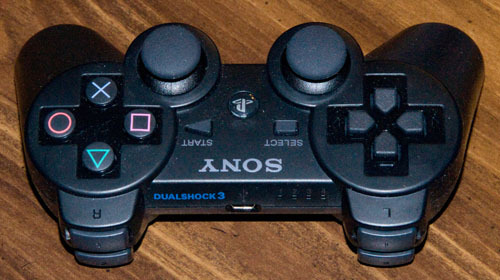 Press down on the top and you’ll hear a very familiar click as the surface depresses a fraction of an inch. There have been video spoofs in the past about Apple’s reluctance to support two-button mice, and the joke was that some day Apple would get rid of even that one button and go with no buttons at all. Looking at the top of the Magic Mouse, it seems the no-button mouse has arrived. Instead of buttons, the Magic Mouse supports gestures. If you press down with your index finger on the center or left side of the top, the Magic Mouse interprets this as a normal mouse click. If you have two fingers touching the top and press down with the right one, the Magic Mouse interprets this as a right-button click. The Magic Mouse detects the touch of your fingers on the top surface, and combines that information with pressure on the top to tell a left click from a right – with perfect accuracy. You can switch the settings for use by left-handed or ambidextrous users; the symmetrical design plus the Mouse Preference Pane make this seamless. We live in an age of Harry Potter and Hogwarts, so doing what any old mouse would do is insufficient to merit the honorific of “Magic.” Naturally, the Magic Mouse does more: physically move the mouse forward, backward, or in any other direction, and the Magic Mouse moves the pointer in the proper direction. Stroke upward or downward with one finger and the document you are viewing scrolls appropriately. Stroke side to side with two fingers and you can advance through pages in Safari or flip through photos in iPhoto. Hold down the Command key while stroking up or down and the entire screen zooms, a great aid for poor eyesight or for public presentations. The Magic Mouse is packed in a plastic case that looks suitable for holding jewelry, possibly a necklace or bracelet, and in the very bottom is a tiny 15-page manual (half of it consumed by regulatory statements) with miniscule print that probably tells you how to operate the mouse. But Mac people don’t read manuals, so Apple thoughtfully included color video clips in the updated Mouse Preference Pane showing how to scroll, swipe, click, etc. The Preference Pane also shows the battery level of the Magic Mouse. 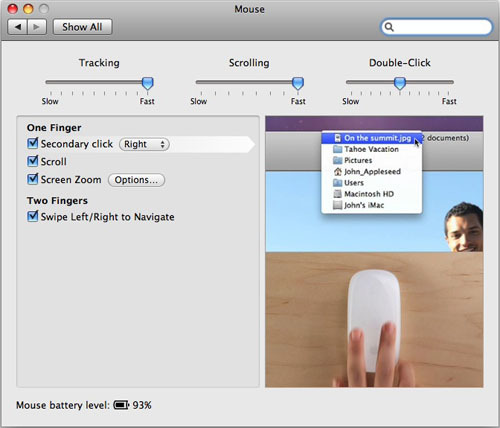 The Mouse Preference Pane not only allows you to customize certain functions for the Magic Mouse, but also shows color video demonstrating how to use it and, in the lower left corner, shows the battery level of the two AA batteries that power the mouse. The Magic Mouse is designed to work with Mac OS X 10.5.8 or 10.6 with Wireless Mouse Software Update 1.0, or with Mac OS X 10.6.2, which doesn’t exist as this is being written. Since it is a Bluetooth device, it also requires a Mac with built-in Bluetooth, which is now pretty much standard. You can get a free Magic Mouse by buying one of the new iMacs; otherwise, Apple sells them for $69.00. The Magic Mouse does have one drawback: if you have more than one Bluetooth-equipped Mac, one Magic Mouse won’t be enough. It spoils you.